In order to create invoices you must first configure the Billing system. If you have not configured the billing features of the system, refer to the Club Billing Configuration document or online articles about configuration for additional information. Once the billing function is configured, the system is ready for you to begin creating invoices. Ensure that you are on the main Billing page by clicking the Admin button on the navigation menu on the left. Using the Portalbuzz system, you will be able to create invoices for individual members and also for all members at once using the bulk invoice feature. Click the red Administration icon and select the Create Invoice option from the list. 2. On the Create Invoice page the default is the list of current members. If the list of members is short, select the specific member from the list. However, it may be easiest to search for the member. Perform a search for the member that you need. If you need help with searching see the Performing a search article. 3. When the member name appears below the search, click the Select button. 4. In the form shown, you will create the invoice for the selected member. Make any changes to the invoice using the textboxes. Note: The invoice form is pre-filled with information including member name, creation date, due date and invoice number. Although it should not be necessary to change any of the pre-filled information, you may edit information as needed. 1. Under Discount, click a discount if one is to be used. The default is None. 2. Under Invoice items, billing codes currently associated with the member are shown. Make any changes to the current associated billing codes, unit cost or quantity by using the drop-down menus. Click the enter key on your keyboard after making any updates to recalculate the total price. 3. To delete the billing code from the member, click the trash icon. 4. 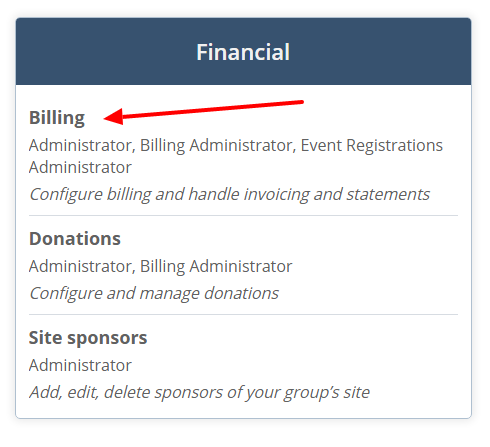 To add a new billing code (invoice item) to the member invoice, click the +Add invoice item button. Use the drop-down menu below billing code to select the code needed. 5. Click the + button under the associated record column to add the code for the member invoice. A new line will be displayed with the newly added billing code. Make any necessary changes to the billing code line. Note: Remember to associate the new code with the member record by clicking the + button under associated record column. If you do not click the + the billing code will not be added to the member. 6. Any credits available to the member will show under the credit heading. To apply available credits to the member, select the option. 7. Type any comments into the Comments textbox. Note: comments are visible to the recipient. 8. Under Options, choose the method of delivery. If you would like to email the invoice, select Email invoice. If you would like to add the invoice to the print queue, select Add to print queue. 9. Click the Create button. The system will return you to the main Billing page and the list of created invoices will be displayed. If you need to email or print a single invoice, find the member and click the actions icon to the right. From the drop-down menu choose print or email. The system creates a pdf file that can be saved and printed. If you need to email or print several invoices, click the box to the left of each member. At the bottom of the page, click Email selected or Print selected.